Virtual worlds are no longer an escape wonderland, they are part and parcel of real life now. Businesses, consultations, meetings, trainings, education- All are being held in Virtual world very regularly.There are a number of options for your virtual world preferences, but Second Life is the most popular. And wherever there are people, health services will follow. Health communication (the mechanism by which health messages are communicated from experts in the medical and public health fields to the people ) , blending closely with Health marketing (defined as creating, communication and delivering health information and interventions using customer-centered and science based strategies to protect and promote the health of diverse populations.) is achieved by CDC in virtual worlds. CDC, entrusted with leading the way in public health, was one of the early adapters of Virtual world. Hygeia Philo (the daughter of the god of medicine, Asclepius, and the goddess of health, cleanliness and sanitation) is CDC presence in the Cyberworld. Virtual worlds provide an immersive experience where users can get health information and practice healthy behaviors. Research in health communication and marketing demonstrates the connection between the ‘modeling’ of health behaviors and the real-world belief that one can turn those activities into actual behaviors. CDC seeks innovative solutions to protect the health of all people and to solve pressing public health problems.The Office of Strategy and Innovation @ CDC encourages use of everyday technologies—such as cell phones, iPods, and the Internet—to promote health …. …ideas such as portable or electronic health records; technological solutions to preventing workplace injuries; new methods for delivering vaccines and medications; bio surveillance monitoring and reporting; and the rich field of research based on genetics.The person behind the avatar is John Anderton, who is responsible for bringing the U.S. Centers for Disease Control and Prevention (CDC) into Second Life. The CDC, as Hygeia, formally entered the SL on July 13 ,2006 (CDC’s 60th anniversary). Now, they have their own Island, CDC Island, and their own group of 124 members,, CDC Group .The other uses of Virtual reality by CDC include preparing field staff (Deployment Safety and Resiliency Team -DSRT-)for stress during Outbreak Response. The CDC is also active in another virtual world, Whyville (www.whyville.net). Whyville has been extensively used by CDC for sharing epidemiological information and promoting health information games . Though Whyville looks amateurish compared to Second Life, the response has been very overwhelming. 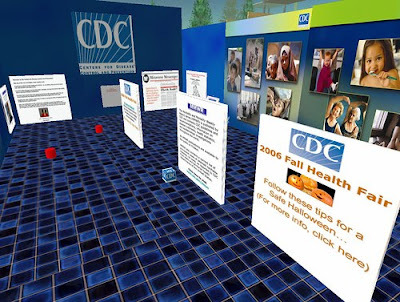 The CDC regularly organizes Health Expos, conferences and meetings in both Virtual worlds. This entry was posted on August 31, 2009 at 1:24 pm	and is filed under Second Life, Virtual reality. You can follow any responses to this entry through the RSS 2.0 feed. You can leave a response, or trackback from your own site.